In a recent interview, a reporter asked me, “How does music fit into Kundalini Yoga?” I could only think of one answer: “You can’t separate the two.” Kundalini Yoga and Kundalini Yoga Music are two sides of the same coin. Both move energy and one leads into and supports the other. If you are beginning a Kundalini Yoga practice, it is important to use music to support your growth. There is so much incredible Kundalini Yoga music that a beginner might need a hand finding some essential albums to begin their Kundalini Yoga practice. There is so much about this album that supports a Kundalini Yoga practice. Like a Kundalini Yoga class, Snatam Kaur‘s Grace begins with “Ong Namo”, the chant used to “tune in” at the beginning of each class. It ends with “Long Time Sun”, again just like a class, and an incredibly beautiful version to boot. This album also has the wonderful “Ra Ma Da Sa” which can be used to support the same-titled Kundalini Yoga meditation for healing. All of the other songs support either fast paced kriya or slow meditation, making it a great album for adding to your collection. This companion CD to Shakta Kaur’s Kundalini Yoga book includes a wide variety of mantra, meditation and Kundalini Yoga support music. It it an indispensable guide as you are first beginning, teaching you Long Ek Ong Kar’s , Sa Ta Na Ma, Sat Nam Seven Waves, and it even has some Gong music to put you into a deep trance. This beautiful album includes the Aquarian Sadhana Chants (Wah Yantee, Mul Mantra, Sat Siri, Rakhe Rakanahar, Waheguru Wahejio, and Guru Ram Das). Nirinjan’s clear voice and vibrant instrumentals are the perfect companion to any morning sadhana practice. Yogi Bhajan said that these chants (plus the Long Ek Ong Kar) would carry us through the Aquarian Age. Good tempo and pacing make this a great album with which to learn the morning chants. If you are interested in accenting your morning sadhana with Japji, this recording is essential to have in your collection. Play it early in the morning and feel the energy of Japji…and learn to recite along with Guru Raj Kaur! Meditation length versions of Ardas Bhaee and Guru Ram Das, two of the sweetest chants in Kundalini Yoga music. Ardas Bhaee is a mantra for prayer and Guru Ram Das is a mantra of powerful healing and miracles. Mirabai Ceiba‘s sweet and loving music are the perfect place to begin learning and using these powerful mantra. You can never had have too many Snatam Kaur CD‘s for your Kundalini Yoga practice. Liberaton’s Door includes many of the songs you love to listen to from Gurmukh’s yoga class (or local teachers near you). Servant of Peace, Mother’s Blessing, Charan Sat Sat and more…you’ll have plenty to play to help you keep up during tough yoga kriya! If you like faster pasted, dance like music, you can try Benjahmin’s Japa Man. 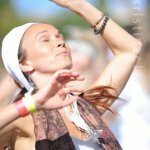 It’s reggae infused style is perfect if you are looking for Kundalini Yoga music with a fresh and hip vibe. Let’s say you’re looking for someone to guide you through Kundalini meditation at home. Look no further. Harijiwan Singh Khalsa, a very beloved teacher of Kundalini yoga, will guide you through meditations to move energy through your chakras and create the change you want in your life. The mantras used in Kundalini Yoga can be a bit overwhelming for the beginner. This amazing resource will carefully walk you through the common Kundalini Yoga mantras so you can practice until perfect. This sweet album with the golden voice of Gurunam Singh is clear like a calm like. The mantras Jai Te Gang and Aad Guray Nameh are perfect for your practice and some of the other songs like “Like a Calm Lake” are perfect for your life’s soundtrack. Simrit Kaur’s voice sounds like the Sweetest Nectar. These soaring vocals will inspire you to keep up with your Kundalini Yoga practice.